These couplers connect two modular RJ50/10P10C 10-pin cables. They are wired straight through rather than crossed over. In other words, they are wired 1:1 (Pin 1 to Pin1, Pin 2 to Pin 2, etc). Each end of the adapter consists of a female connector and thus can be used to couple two male cables. 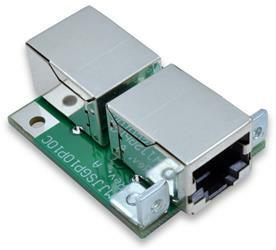 This product is designed to provide convenient through-panel connections for RJ50/10P10C cables. Note: RJ45 (8P8C) connectors have eight pins, whereas the RJ50 (10P10C) connectors on this coupler are the same physical size, but with 10 pins. RJ50/10P10C is sometimes erroneously referred to as "RJ45 10 pin." These couplers are designed to mount behind a panel face and extend through the panel, thus providing a convenient termination point for RJ50 connections which must extend outside of a panel enclosure. 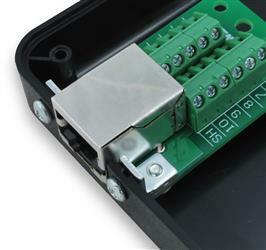 One of the RJ50 connectors on this product overhanges the printed circuit board by approximately 3 millimeters, thus extending the connector face through the panel and out to the face of the panel. A cutout must be made in the panel to accommodate the RJ50 connector, and two holes are needed for the mounting screws. Please consult the product data sheet for details. The RJ50 couplers are designed to be panel mounted as shown. Note that the BRKSM10P10CSJ-R-P is shown, but the same mounting scheme is used for the MJJSGP10P10C-A.